Roger Sutton, the recipient of this year’s Editor’s Award for Outstanding Contribution to the Sector, has spent almost 25 years in the electricity sector. After an early spell as an engineer and business analyst with the former government-owned ECNZ, Sutton joined Christchurch-based Southpower where he would remain for the next 22 years in various roles as the company evolved with the progress of the electricity reforms. In that time, Sutton was active in the debates about the development and structure of the electricity market. He spent time on NZEM working groups and in 2011 his expertise saw him brought to Wellington to provide advice to the government during the power crisis of that year. His pursuit of engineering innovation, and its potential benefit for consumers and the environment, saw him serve on the boards of both the Centre for Advanced Engineering and the Energy Efficiency & Conservation Authority. But throughout that period, Sutton was also advancing ideas that are today considered mainstream: the potential of embedded generation for demand lopping. The use of network pricing to encourage load shifting, and regional coordination of interruptible load to deliver transmission savings. Energy News editor Gavin Evans says Sutton’s biggest contribution to the industry – and the country – was probably in the culture and the professional rigour that he harnessed and developed at Orion after becoming its chief executive in 2003. Orion’s performance through the earthquakes of September, February and June has been outstanding, Evans says. “The standard of the original network engineering, and the pace and the strength of the company’s response, will become a yardstick for the rest of the industry.” He says. 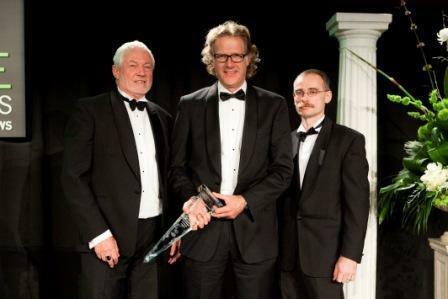 In 2011 the Editor’s Award for Outstanding Contribution to the Sector category was sponsored by EECA.